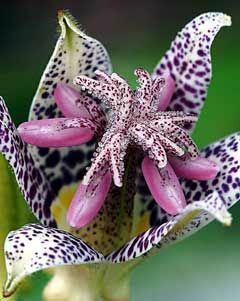 Tricyrtis hirta, the common toad lily, is widely grown in residential gardens. It grows 2 - 3 feet tall with funnel shaped flowers that are white with purple spots. The toad lily is hardy to USDA 4-9.